852839 Nute Gunray Key Chain is a key chain released in February 2010 as part of the LEGO Star Wars: The Clone Wars Theme. A Nute Gunray Minifigure with a keychain is included. This is a description taken from LEGO.com. Please do not modify it. (visit this item's product page) Nute Gunray guards your keys! 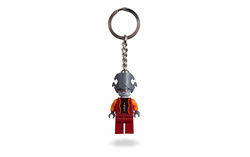 Facts about "852839 Nute Gunray Keychain"
ShopDescription Nute Gunray guards your keys! This page was last edited on 10 January 2016, at 00:00.